We had been invited up to Sweden for the DIY Sibbarp Skate weekend over a month before but as the weekend drew near, the first Issue of Confusion was still not off to the printers and I almost canceled the trip. But my old saying is “It’s better to go and regret going, than not going and regret not going.” And I never regret it. So we closed down the Confusion offices on Friday morning, caught the train to the Köln airport and 2 hours later we arrived in Copenhagen airport. A short train ride over the Oresund Bridge (which connects Copenhagen to Malmö) and we were in the DIY Skate Mecca of Malmö, Sweden. Roadie and myself hooked up our skateboards we had to dismantle for the plain ride at the train station and skated 10 minutes to Stapelbädsparken, after stopping in at a 7-11 to pick up some local brews. At the park we met up with my buddy David “Tomsie” Toms who I’d stayed with in Dublin a few years back while he was building some parks outside of Dublin and who is top dog for Concreatures Concrete Parks and oine of the guys behind VikingBlocks Pool Coping. 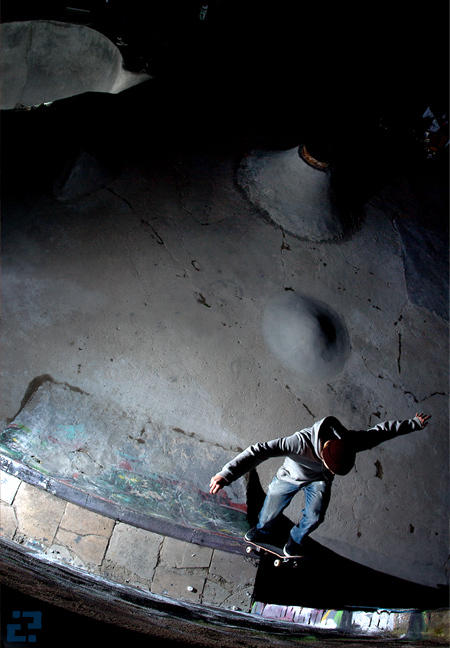 He was cruising the park after work and we met up with young gun ripper Andreas “Snoken” Lindström who was destroying the park with smith grinds over the love seat on the flat wall and sick high speed airs and disasters. We had no real plan, and not even a confirmed place to stay, but we were just going with the flow and seeing what happened. We had originally thought of camping but we had no tent, no sleeping bag, and the weather was threatening to rain. Tomsie was heading over to the Sibbarp park for a few minutes so we jumped in his van and 15 minutes later arrived at the new Sibbarp Skatepark. 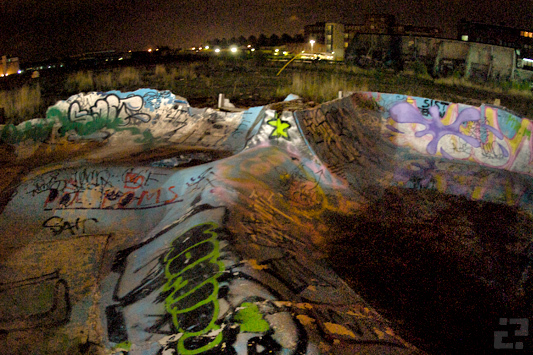 Built by Concreatures Skateparks, the whole park is more like a street course, with small obstacles all over, including about 10 pump bumps, Viking Block pool coping, a large rock you have to grind over, a volcano, and a vert wall with a wave painted on it. The park didn’t look so exciting at first glance (or from photographs I’d already seen). It’s rather small in height but it’s super fun and you can just cruise around it and figure out your line as you go. The park has a good flow and there’s endless possibilities and endless grinds to be had (or aerial antics for you hot shots.). We had other plans for the evening so we headed over to Per Mag’s house where Linus and Per were waiting for us. 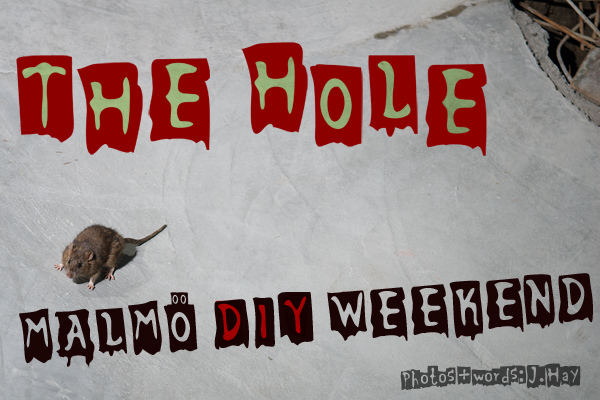 We grabbed some more beers from the corner store and skated over to the latest DIY project: THE HOLE. The Hole, as the locals call it, is built in the same abandoned lot where Steppeside once flourished, but has since been sledgehammered to death. The Hole is against the wall and more concealed than Steppeside which was right in the center of the lot and easy to see from anywhere. The Hole has a round bowl with a channel which at the time we were there had no coping, just a rough edge with rebar sticking out and also a big hole in the bottom. A complete Death Pit that I wanted nothing to do with at the time. When we arrived, a session was already underway with the usual suspects. I don’t go to Malmö very often, in fact the last time I went up there was 2007, but the Malmö locals are like brothers to me, and always show a good time. They are real skateboarders. They love skateboarding. And the skill level in Malmö is high and ever on the rise. 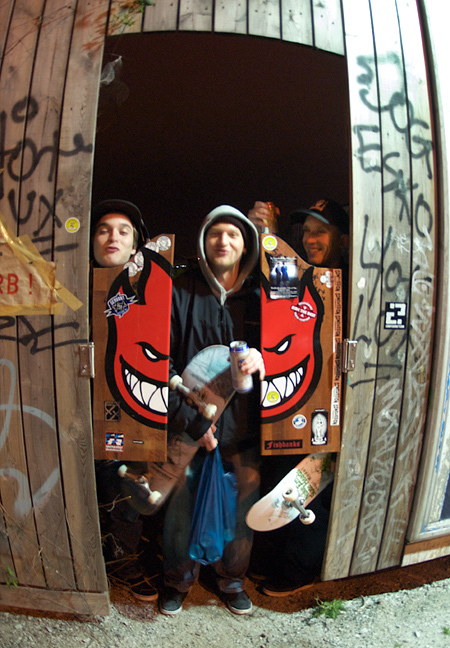 Linus, Marcus, Johan and Pär proceeded to put on a demo of the Hole, with tailblocks, pivots, smith stalls, disasters, bonelesses, wallrides and Johan’s frontside blunt transfer from the quarter pipe. I climbed up on the roof to shoot a few photos from above so you can see the whole setup and we watched a rat try to run out of the bowl to no avail and returned to his home in the hole and then darkness was upon us. We walked over to check out Steppeside in the middle of the lot. It was dark and I ran down the transition with my camera in hand only to discover there was a solid foot of water in the bowl….. Wet feet and famished, we headed to a pizza restaurant down the way where we ate, drank and merrily played some pool and hung out with Pontus, J. Mag and the rest of the Malmö skate crew. Sometime around late night we headed back to Pär’s where all beds and couches were occupied, so I slept the night on a nice hardwood floor without a sleeping bag, lulled to sleep by Roadie’s epic snoring. The next day was to be the Sibbarp DIY Skate contest, part of the Betongcup (a concrete skate park series in Sweden), but the rain was falling and chances of the contest happening the next day were slim. There was a back up plan to skate the indoor park of Brygerriet with bands playing overlooking the street course and have the contest the following day. Not to go unmentioned, the world premier of Pontus Alvs’ second full length film, “In Search of Miraculous” was playing at an old Cinema. Expectations were high and no matter what, the following day was going to be a good time, rain or shine…. Marcus"Pyssling" Olsson. Pivot on the corner block. 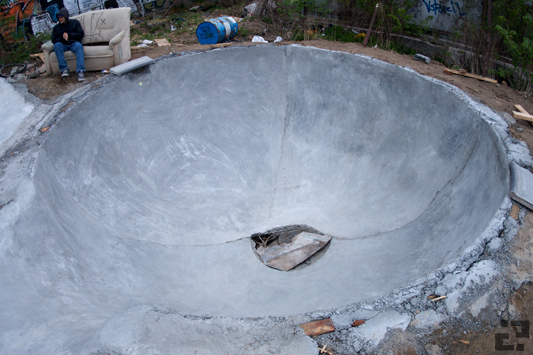 Pär Mag, backside disaster in the coping less round bowl.